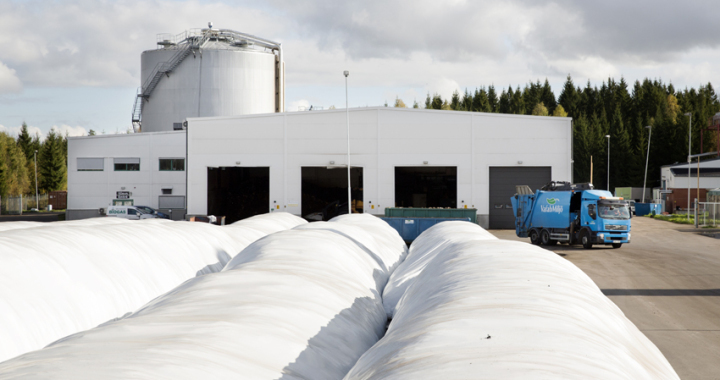 VafabMiljö owns a biogas plant, at the Gryta Waste Treatment Plant. Foodwaste from households, ley crops and grease trap removal sludge is processed into biogas and bio-fertilizer. There is also a plant for the upgrading of biogas to vehicle grade fuel. Refuelling stations have also been built for buses and cars, and storage is arranged for ley crops and the residual digested sludge for farming. This is the result of a project that was started more than 15 years ago. The plant was started in the summer of 2005 and has been in full operation since 2006. The plant can process about 18 000 tonnes of foodwaste a year, ie, organic waste from households, large-scale kitchens and restaurants, about 3 500 tonnes of sludge from grease separators and about 1 000 tonnes of ley crops. This, together with biogas from the Sewage Treatment Plant, is estimated to produce vehicle fuel to the equivalent of about 3,8 million litres of petrol per year. Wilted and chopped ley crops together with the source-separated bio-waste (foodwaste) from the VafabMiljö region (municipalities in Västmanland and also the Heby and Enköping municipalities) are processed in the biogas plant. The system for source-separation of foodwaste in households is based on the paper bag model in which foodwaste is kept in special-purpose paper bags made of wet-strength paper. Bio-waste from restaurants, etc, is dealt with on the same principle. Also other organic waste such as the sludge from grease separators in restaurants and large-scale kitchens for example will be processed. The material is mixed with water and then decomposed in an oxygen-free digestion chamber where microorganisms break down the mixture. Biogas consisting mainly of methane is generated in the process. The gas is utilised only as vehicle fuel. The biofertilizer is divided in a liquid and a solid part. The liquid fertilizer has high nitrogen content and can be spread beneficially on arable land in the spring. The solid fertilizer has high phosphorus content and can be spread mainly in the autumn as soil conditioner.